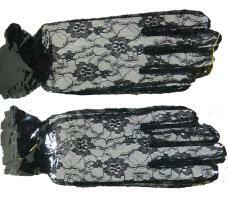 Ladies Black Lace Formal Dress Gloves. 1 pair. Beautiful lace floral pattern for formal events such as church or funerals. Open frilled cuff with slight elastic 2 1/4" from end. Approximately 10 1/2 inches long from fingertips to cuff. Each pair is individually packaged in its own resealable poly bag.